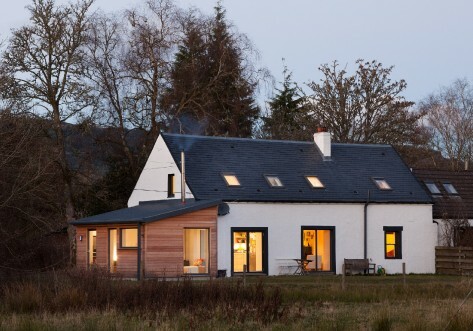 Challenged to design an extension to a 19th century cottage close to the shores of Lake of Menteith, Thomas Robinson Architects wowed their clients with a plan to create two obviously modern additions. The owners of Garden Cottage needed more space to meet the needs of their growing family and loved the idea of extending on two sides using entirely contrasting materials. What was once a cosy but slightly dark property is now a fantastic, warm, light-filled home with additional living and bedroom space. The house now features a bigger kitchen, a garden room, more storage space, an extra bedroom and new hallway which has allowed the stairs to be moved out of the lounge. The clients were amazed at how quickly Tom and Fiona Robinson tuned into what they needed from the project and are delighted with the end result. Tom said: "The property owners really liked the idea of the traditional cottage still being very obvious with contrasting additions. "They really appreciated our advice about the practical requirements of the project, while still creating fantastic lines of light and symmetry in the house. They are thoroughly enjoying the practicalities of their larger home and also appreciate the fact light pours in no matter the weather."